In both humans and farm animals, time is crucial when diagnosing illness. An early diagnosis means treatment can be given before the disease worsens. In some forms of aquaculture, the diagnostic time line stretches out a little longer. Fish farmers need to take a boat to the offshore cages where salmon are raised. Samples are taken back to shore and tested in a lab. If disease is found, the farmer needs to boat out again to the cages to administer treatment. Nanopore Diagnostics is trying to shorten the timeframe for diagnosing and treating fish raised in offshore farms. The St. Louis startup has developed a portable diagnostic technology that it says returns test results on site and in minutes. The diagnostic technology took the top prize this year in the Crop, Animal & Food Tech Showcase, an annual event held last week by the North Carolina Biotechnology Center. A total of 11 startups from across the country and one from overseas pitched their technologies in this year’s event in Durham, NC. The pathogens that Nanopore is screening don’t pose a food safety concern, according to Tom Cohen, the company’s co-founder and CEO. 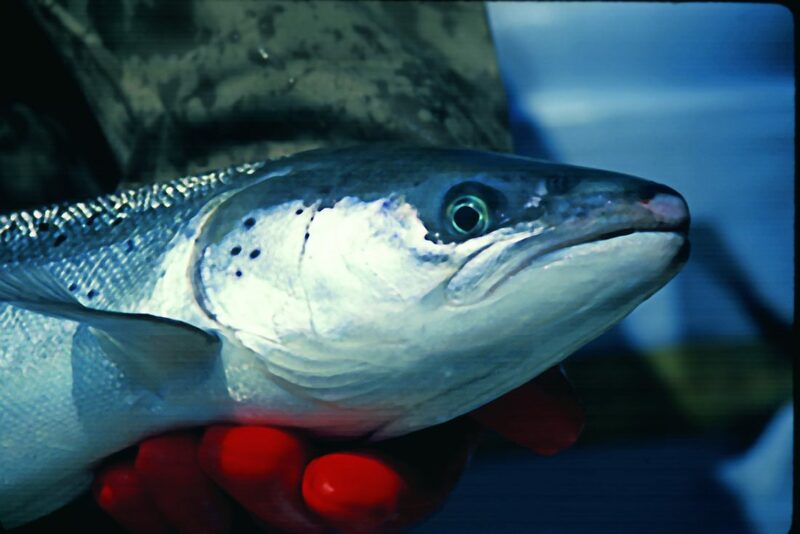 But illness can keep the fish from reaching market weight, which affects the yield of salmon farms. Biological disease costs salmon farms hundreds of millions of dollars each year, Cohen said. Diagnosing disease early in salmon is important because sickness can spread quickly in the crowded offshore cages that hold thousands of fish. Nanopore’s technology, called the iNDxer, detects DNA and RNA specific to certain bacteria, viruses, or fungi that can lead to disease. The test requires a swab of mucus from a fish gill. The software for the test can run on a tablet or smartphone. Cohen, whose background is in software engineering, says that the accuracy of the technology is comparable to that of real-time polymerase chain reaction (PCR) laboratory tests—without the need to boat back to shore and send samples to a lab. There’s no need to test each fish, just a sampling from each cage. “We can screen 50 fish at an affordable price on-site,” Cohen said. Cohen said Nanopore decided to target salmon first because this market is more technologically advanced than other forms of aquaculture and it offers more financial opportunity. In time, the company could expand the technology to other forms of aquaculture, animal husbandry, and human health. Nanopore, which spun out of Washington University, has raised $1.2 million in financing to date. Cohen now says the company is now raising a $900,000 bridge round to pay for tests of the technology in salmon cages off the shore of Vancouver Island, British Columbia. The cash will also support further development of the technology to prepare for a market launch. It’s the second time in the last three years that the showcase’s top prize was won by an on-site diagnostic test. In 2016, Portugal-based Magnomics won for its handheld diagnostic test for a dairy cow infection. For its win this year, Nanopore received a $10,000 cash prize. The runner-up was General Probiotics, a University of Minnesota spinout that is using synthetic biology to develop a new class of probiotics—beneficial bacteria—that could replace the antibiotics that are being phased out of use in farm animals. Yiannis Kaznessis, founder and CEO of St. Paul, MN-based General Probiotics, said that the company is now raising $3 million as it lays the groundwork to take its products to the FDA for review. As the runner-up, General Probiotics was awarded $2,500 cash. —Agrospheres. As much as 90 percent of chemicals sprayed on crops don’t reach the target plant, says Reese Blackwell, CEO of Agrospheres. His Charlottesville, VA-based startup has developed a bioparticle that encapsulates a crop protectant or insecticide and delivers it to the target plant. He says the technology can save growers money because it reduces the amount of an active ingredient they need to apply to crops. AgroSpheres is trying to raise $1.5 million for greenhouse tests.